One of the problems with having a constantly changing art team for an ongoing book is that it is very difficult to maintain the tone of a multi-part story. 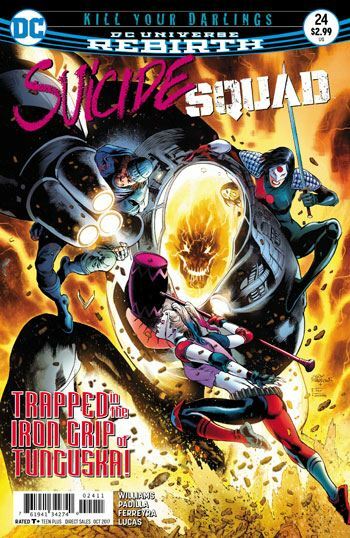 That is hugely in evidence in the latest issue of Suicide Squad. In and of itself I quite admire the work done on this issue by Agustin Padilla and Juan Ferryera. It is dark and gritty, highly dynamic when it needs to be. But the contrast with the previous issue is so severe that whatever flow there was meant to be in this story arc is radically undermined. I suppose it also doesn’t help that I just didn’t enjoy this issue as much as I wanted to. Batman launches a one man assault on Belle Reve. That should be great. 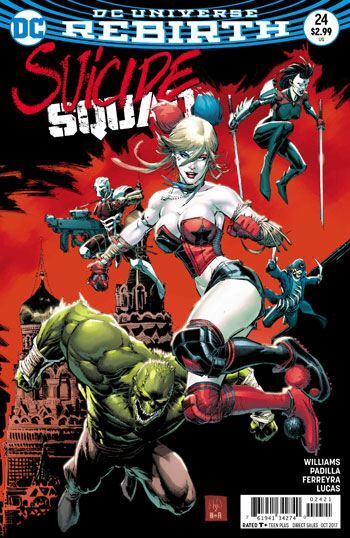 His fights along the way are decent enough, but once again I just don’t care for how Harley Quinn is being handled in this book now, since the death of Rick Flag. She just doesn’t feel like the same character. Katana gets some good development. By and large her character has been pushed to the side, so it’s about time more gets done with her. There is a solid twist at the end, one which I really did not see coming, and which makes sense given the actions of a certain character in the last few issues. So I really ought to have enjoyed this story more. I wanted to. Was it the art, then, that was the problem? Perhaps it was. I simply didn’t feel like I was reading a continuation of the previous issue. It jarred me so much I just never got my grounding enough to have fun.